Abstract: Jack suffers from hind limb neuropathy, chronic back pain, and dysfunction along his neck and shoulders. Acupuncture helped his comfort and possibly his endurance and forward motion. History and Presentation: Jack is an 11-year-old warmblood gelding who presented for chronic back and stifle issues. The owner acquired Jack about 1-2 years ago, and at that time, Jack displayed aversion to the saddle and bucking when the owner attempted to mount. Thinking this was a saddle-fit issue, the owner bought a new saddle about 2-3 weeks after acquisition. Jack is more amenable to riding but still displays signs of back pain and stifle issues. Jack is used mainly for pleasure trail rides. Jack is not on any medication and has no previous medical/diagnostic history. His diet is forage (grass/Timothy) and one-quart Nutrena maintenance grain daily. Jack has never received acupuncture before. Training methods are unknown. Physical Examination and Clinical Assessments: 7/7/2018 – Jack presents BAR. Temp=100.9° F, Pulse=24, Resp=8, Body Condition Score (BCS) 7/9, Muscle CS 3/3, OP-mucous membranes light pink, moist, CRT<2sec; nares clear; OU clear, PLRs WNL, palpebral WNL; AU WNL; cardio/lungs – no abnormalities detected upon auscultation; peripheral digital pulses strong; int – WNL; abd – appropriate borborygmi; urogenital WNL; Musculoskeletal (M/S), Myofascial (MF), and Diagnostic Acupuncture Exam (DAPE) exam – reaction L>R supraspinatus and L TH 15, back trigger points (TPs) bilat inner BL line from T12 to caudolumbar especially outer BL line caudal to BL 52; decreased neck range of motion (ROM) to R; decreased willingness for upper cervical dorsoflexion; neck flexion to elbows and knees ok, grazes appropriately; temporomandibular joint (TMJ) assessment WNL bilat and separately; ambulatory x4, L hip higher at walk, R hind slight external rotation; balance WNL; distal mobilization WNL x4; hind circles slightly decreased bilat; Unsure if sacroiliac (SI) pain present, not able to apply ventral pressure; Neuro – bilat hind dragging hooves, CP deficits L hind>R hind, dragging hind when walking in circle, bilat hind limb deficits exaggerated and stifle locking when walking downhill, backing up L stifle extension, tail pull WNL, walking with head raised WNL, cranial nerves (CNs) WNL; Tack use and fit and rider skill not evaluated. 2. Back pain – r/o secondary to lameness (compensatory) vs disc degeneration vs muscular vs neurologic disease i.e. spinal nerve compression or malfunction secondary to vertebral malformation vs skeletal i.e. lysis, fractures, spondylosis, kissing spines vs inflammation vs somatovisceral (ie gastric ulcers, less likely) vs saddle misfit vs poor rider balance/excessive spurring/awkward leg position vs improper frame vs repetitive stress vs genetics vs trauma/fall vs neoplasia vs poor shoeing vs metabolic disease i.e. PSSM/EPSM, insulin resistance (less likely) vs infectious i.e. Herpes (less likely) vs nutritional i.e. low lysine, selenium, vit E (less likely) vs other. 3. Decreased neck ROM to R, decreased dorsoflexion – r/o upper cervical (Occiput-C1-C2-C3 joints) i.e. rider hands, poor biting/teeth, inverted or over flexed frame vs lower cervical vs foot pain (compensating with brachiocephalicus muscle) vs other. 4. Shoulder sensitivity – r/o primary shoulder muscle and/or nerve vs secondary to neck pain vs saddle placement vs other. 1. Primary neurologic problem, neuroanatomic localization either T3-L3 or L4-Sacrum – cause(s) above still undetermined. 2. Back pain – suspect secondary component due to neurologic deficits and compensation, could easily have a primary musculoskeletal component. 3. Neck and shoulder sensitivity – cause(s) above still undetermined. Medical Decision Making: The neuroanatomic localization of the lesion is the spinal cord (versus the forebrain, cerebellum, etc. ), and due to the bilateral hind limb deficits and Jack’s reproducible response in the outer BL line area of L4-L5, this could be more specifically either T3-L3 or L4-sacrum. Spinal nerves run caudally, so pinpointing the specific area of the lesion depends on the trajectory of the nerves in this area (3rd versus 4th lumbar spinal nerve). I needled around this reproducible TP area and will work towards more direct needling as Jack tolerates. Centrally, points involving the caudal lumbar spinal nerves as the origin of the sciatic and femoral nerves were chosen and will start incorporating BL 26, 27, 28, 29, and 30. Peripheral nerve points may help as another way to access nerves and encourage communication i.e. BL 39, 40, 60, GB 30, 39, KI 3 and ting points. Most of the other chosen points along the neck and back were TPs elicited upon exam. I didn’t appreciate neck discomfort on the MF and DAPE exam, but I did appreciate decreased ROM, so I am assuming there is discomfort. Along the thoracolumbar (TL) spine, not only was I trying to influence specific TPs found on the exam, but also the iliopsoas group since the attachment occurs between T16-L1, which is very important for propulsion. Given the nature of a horse’s work and where a saddle is located, the TL spine is influenced tremendously by saddle fit, blanket misfit, and the rider. The TL junction specifically is an area of high biomechanical stress since this is where fixed ribs meet the highly mobile lumbar spine. Saddles often bridge here as well. Further diagnostics to rule out specific causes include radiographs or myelography to r/o Wobblers, blood work or cerebrospinal fluid (CSF) to r/o EPM, and PCR to r/o EHV-1, as well as a full lameness evaluation and evaluating the saddle fit and rider. Ultrasound may be helpful to determine the diameter of the multifidus muscle since atrophy is linked to pain, destabilization, and poor outcome. The autonomic component included GV 24/Da Feng Men and GV 14. 7/7/18 – Dry needled GV 24, BL 10, 12, 13, 17, 18a, TH 15, and SI 11 and 12 on L, BL 11, GB 21, LI 16, GV 14, and Bai Hui. Jack started getting worried so did not finish bilateral of all points. 7/22/18 – Same plus BL 10, 12, 13, 17 and 18a on R, BL 18b, and BL 23. Jack started to become uneasy so stopped. 8/5/18 – Same plus Da Feng Men, TH 16, BL 19, 19’, 20, 21, 52, 25 and TP on outer BL line. For R side neck and shoulder points (BL 10, TH 15, TH 16, GB 21, LI 16, SI 11 and 12), I started with DBC needles (see below), but Jack was getting irritated, so I continued all other points with Seirin blue. Exercise – Discussed and recommended the following exercises for the owner to continue at home. These help to increase blood flow, range of motion, flexibility, and strength. • Forelimb and hindlimb circles: 5 in each direction, keep limb low to ground, start small and will increase with horse’s comfort. Better after minimal warm-up. 3-4x/week. • Scrunch up: one time per leg, all the way up to get full range of motion on all joints. • Neck ROM: can use carrot, great for core strength. Bring neck to chest, then to elbow, then to hock (most difficult). If using food lure, recommend giving only one treat at the very end, so Jack doesn’t get too much sugar and doesn’t learn to always expect treats. • Belly lifts: once from each side; then to increase difficulty, ask Jack to keep back up during grooming, putting head down while lifting belly, etc., extending slowly for longer periods of time. • Multi-surface pathway: to continually re-stimulate proprioceptive input. Hand walk horse across it several times per week. I.e. ground rails, change in surface, about every 8 feet the surface changes, or serpentine across surface change over and over. Each time horse crosses onto a new surface, need to think about where limbs are and where to put feet. Heat – Providing a radiant heat lamp above Jack may be great for back injuries. This increases blood flow, controls pain, and may help chronic injuries. • GV 24/De Feng Men – Similar to GV 20 for small animals, near here is where C2 and C3 spinal nerves converge with cranial nerve (CN) V (trigeminocervical convergence), which could produce reflex improvement in the cervical region. This point is also parasympathomimetic through crosstalk with the vagus nerve. Crosstalk occurs between the trigeminal nucleus of CN V and the dorsal motor nucleus of the vagus nerve, stimulating vagal neuromodulation and producing neurotrophic, anti-inflammatory, and calming effects and pro immune balance. • BaiHui & GV 24 – In general, cranial and sacral areas have high parasympathetic input so stimulation in these areas can lead to overall relaxation due to the large autonomic switch. Points such as GB 20, BL 10, TH 16, and SI 16 can simulate this as well. • GV 14 – This point serves multiple purposes. First, it’s a nice point to see how a patient will react during the first acupuncture treatment. Second, it’s a local point for the neck pain. Third, this is an autonomic point since there is direct connection with the intermediate lateral gray column in the spinal cord where the sympathetic neurons begin. This information then travels to the hypothalamus and affects the neck and head in route as it passes through the T1 spinal cord (SC) segment. Sympathetic hyperactivity in the cranial thoracic SC segments can cause somatic dysfunction. By decreasing this, we can improve blood flow, nutrient supply to the tissue, waste product removal, and immune response. This will also improve the delivery of medications and herbs. This point helps to provide autonomic homeostasis. • BL 10, TH 16 – These points are for local cranial cervical pain, tension, and dysfunction/decreased ROM. Also, the cervical nerves converge with trigeminal input at C2-C3 spinal segments near where these points are, and the mechanoreceptor input interrupts this trigeminocervical reflex reducing pain, wind-up, muscle tension, and improving circulation. Crosstalk with the NTS also helps to support vagal tone while decreasing sympathetic over supply. • A discussion for cervical and back points in general: BL 11, 12, 13, 17, 18a, 18b, 19, 19’, 20, 21, 23, 52, 25, and outer BL line TPs. o Any point along the ventral border of the brachiocephalicus muscle i.e. LI 18, modulates around the transverse process of the vertebrae and the spinal nerves traveling up to two segments below the point. For example, needling LI 18 affects the spinal nerves C3 down to C5. The influence of this overlapping treatment also occurs throughout the back by influencing the multifidus muscle. o Any point along the dorsal border of the brachiocephalicus muscle i.e. LI 17, SI 16, TH 16, addresses the facet joints. For example, the transverse process of C3 is at the same level as the facet joint for C3-C4. o The anticlinal vertebrae occur at about the 15th to 16th ribs. Horses are often sore at BL 18 -19 where there’s an abrupt transition from the horizontal to the vertical joint plane. Jack was definitely sore here, which accounts for the use of all of the BL points. o The crus of the diaphragm attach to the ventral crest of T15-L3. If there is dysfunction in this area of the back, it may cause decreased ventilation and endurance. This is another benefit to treating BL 19-23.
o GB 21 is also a good point to see how Jack would do with acupuncture. o LI 16 is often used as a first point to make a horse feel comfortable. o The supraspinatus muscle is supplied by the suprascapular nerve from the 6th and 7th cervical nerves. In the horse, the sharp scapular border and the absence of an acromion may increase the chances for mechanical trauma to the nerve. SI 12, which is in the middle of the belly of the supraspinatus muscle, is sometimes difficult to needle. KI 27 and LU 1 are in part innervated by C6-T1 spinal nerves, so for future treatments, these points may by useful when trying to get some somatic afferent input to this area. o ST 36 – This distal point also has parasympathomimetic/anti-inflammatory effects. This is achieved through the somatoautonomic reflex arc. Somatic afferent information from the needle at ST 36 goes to the nucleus tractus solitarius (NTS), which crosstalks with the trigeminal nucleus of CN V and the dorsal motor nucleus of the vagus nerve, stimulating vagal neuromodulation and producing neurotrophic, anti-inflammatory, and calming effects and pro immune balance. • Electroacupuncture down the BL line and laser. Based off of results from the Xie paper, I would laser GV 6 to BaiHui and BL 26 to BL 54. This significantly reduced thoracolumbar pain scores, and pain reduction lasted for 14 days. Outcomes, Discussions, Impressions, and References: Our goals for Jack include proprioceptive retraining and NS communication, pain relief, and muscle spindle normalization. Initially, the owner reported that his stifles seemed to lock more on the trail rides. After more sessions, the owner saw him engage his hind end. Jack still dragged his L hind toe, but the owner didn’t see him lock up as much. Jack improved his forward motion, especially into the canter. This is good news if it’s based on heightened muscular control and improved strength, however, if this is a neurologic change, neurologic deficits can be unpredictable, so this may give both Jack and the owner false confidence of stable footing. Riding a neurologic horse can be dangerous, and this may have legal implications on the vet’s end pending what we recommend to the owner. This involves assessing the safety risks to the rider and handler, liability concerns, and animal welfare. Declaring whether or not the horse is safe to ride is a complex task. Though a neurologic condition does not automatically mean the horse cannot be used, we have to be careful. The severity and nature of the deficits are things to consider in making this decision as well as the horse’s intended use. Jack’s neurologic deficits are obvious at all times when he is walking and trotting. Since Jack has not been evaluated yet with the rider, I can only assume that the deficits would be worse with the rider. I am unsure if these deficits would be obvious to other laymen observers, so I would classify Jack’s spinal ataxia at a grade of 2-3. Once at grade 3, it is recommended by certain leaders in the field that the horse should not be ridden. Since Jack was purchased with this condition, it is unclear at what point his neurologic deficits surfaced or whether they started as acute. Knowing these things may help determine how long the horse will be safe to ride. Jack is not a “hot” horse, so fortunately, I don’t think he would panic if he loses his footing, but I can’t predict how even the mildest of horses would act in an uncomfortable situation. Overall, despite how experienced a rider may be, preventing a fall is virtually impossible. I would consider Jack a high-risk horse to ride. I would tell the client as such and recommend that Jack not be ridden. I would inform her that Jack’s current neurologic deficits are worse going downhill and in circles. I still believe that Jack is safe to be around people that are aware of their surroundings and can move without physical debilitation. Given that Jack is not safe to ride right now, I would highly encourage pursuing diagnostics, because treatment is difficult without a diagnosis. If there is an underlying infectious cause, treatment may help improve Jack’s condition. I would continue to encourage the owner to do exercises with Jack. Otherwise, Jack should enjoy the safe, luxurious life of a retired horse. • Stubbs NC et al. Osseous spinal pathology and epaxial ultrasonography in thoroughbred racehorses. Equine Veterinary Journal. 2010;42 suppl:38:654-661. • Haussler et al. TB spine and pelvis. AJVR. 1999: 60:143-153. • Stubbs NC et al. Active ROM as a diagnostic and therapeutic tool. Equine Vet J. 2011 Sep; 43 (5): 522-9. • Xie et al. 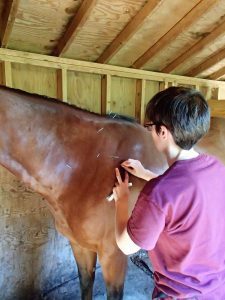 Evaluation of electroacupuncture treatment of horses with signs of chronic thoracolumbar pain. JAVMA. 2005;227:281-286. • Degueurce C et al. In vitro assessment of movements of the sacroiliac joint in the horse. Equine Vet J. 2004;36(8):694-8.